The Danish maritime service provider VMS Group establishes new test facilities to cover the need for independent testing of all engine types in Europe. The new test facilities located at the Port of Frederikshavn makes independent testing of all engine types possible. We have not encountered any other European facility that can offer these independent test runs. We offer test drives of engines, generators and other related equipment of all brands, explains CCO of VMS Group, Kim Rasmussen. The test hall is crucial for VMS Group to utilize the full potential of a new business area. In 2016, VMS Group achieved the German and Scandinavian agencies of the GE engine types V250 and L250, and this was a breakthrough which boosted competence of the innovative Danish company. 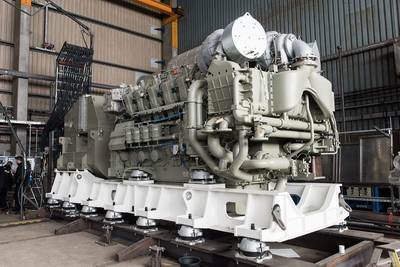 In addition to the actual sale of the engine, VMS Group is providing assembly of the gensets according to the customers' wishes, including the design of the foundation frames, technical calculations of vibrations and noise levels and the on-board installation and commissioning of the final gensets on board. The new test facilities ensure that VMS Group can run complete tests on the assembled gensets before they are shipped from Frederikshavn to be mounted in vessels worldwide. The first gensets of VMS Group's own design have already been tested in the facilities. Shortly they will be shipped from Frederikshavn to the Norwegian shipyard Ulstein Verft to be mounted in a newbuilding for the American cruise line Lindblad Expeditions. Ulstein Verft placed the order with WMS Group in 2018, and after thorough analysis and development efforts from the ship design and engineering team of VMS Group, the gensets are now ready for delivery.